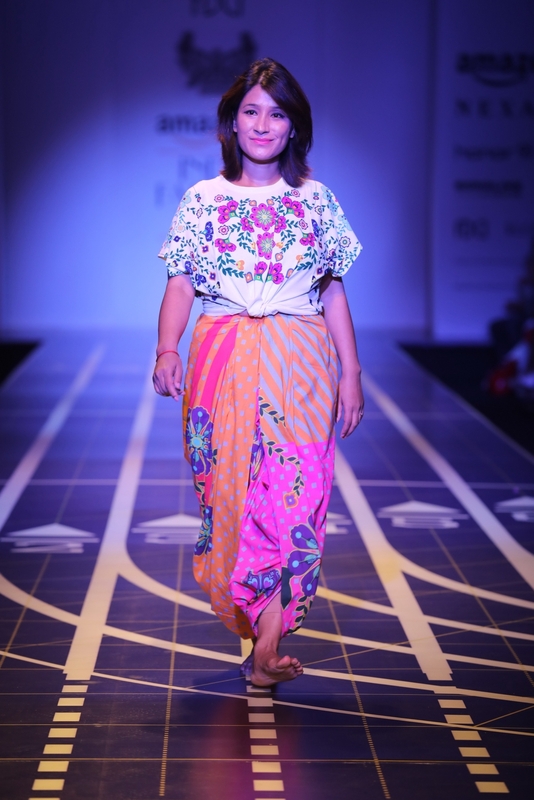 Nida Mahmood, the master creator of unique prints who is popularly known as the Queen of Kitsch presented her collection in collaboration with Deivee, an active lifestyle brand from India founded by Milind Soman and Darshan M at the Amazon India Fashion Week Spring Summer 2018 in association with Nexa. Fashion, graphics, art, creativeness, film, installation, interiors are Nida’s main forte and she presented an atheleisure and sporty collection inspired by the four zones of India, East- ikat (from Orissa), West- indigo printing & dyeing (from Gujarat/Rajasthan), North- rich Banarasi brocades (Mughal patterns of delicate flowers and leaves on delicate creepers), South- Uppada and Narayanpet sarees (inspired by stripes & colour blocking). The very famous initiative Pinkathon by Milind Soman is the basis of the collection and the collection wants to inspire every soul no matter what age, shape or size to be fit inside out. Talking about the show, the show was an ode to Deivee ji which actually means goddess. The collection is for the woman who is powerful, fearless, bold and strives towards self transformation for a fitter and healthier lifestyle. With the sport and energy filling her life with colours, She walks, stands tall and faces the world regardless of the age barrier. Her soul is empowered and divine that is why she is Deivee ji. We could see Lovely flowers, leaves and stripes on various garments on the ramp complemented with big white bindis, golden nath with high ribboned braids which the models sported with bright colors making a statement. 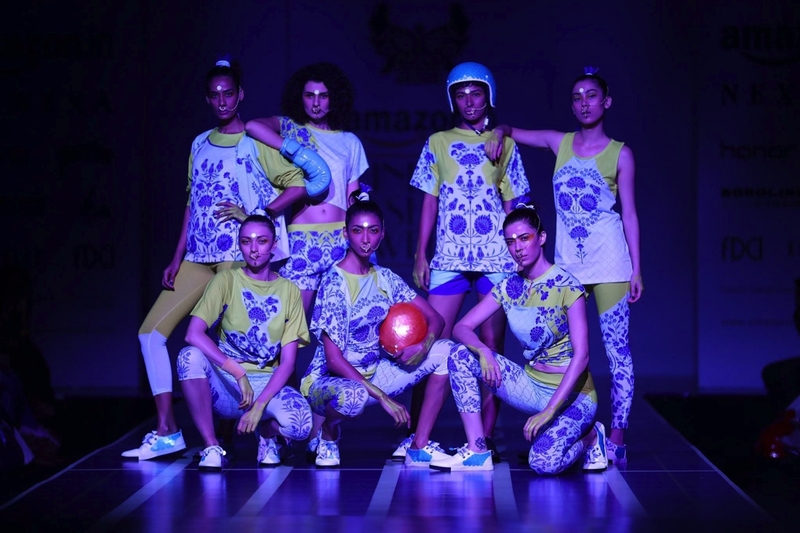 The models had basketballs and colourful helmets in their hands sporting sneakers, they playfully sashayed the ramp from treadmill to the dance floor. The smart shoes, tees, shorts, tracks were made with 100% recycled plastic bottles and the garments have quick dry technology with anti-microbial elements. The atheleisure range also has it’s first ever Running Sari for women ensuring the collection is designed for all ages, shapes and sizes. 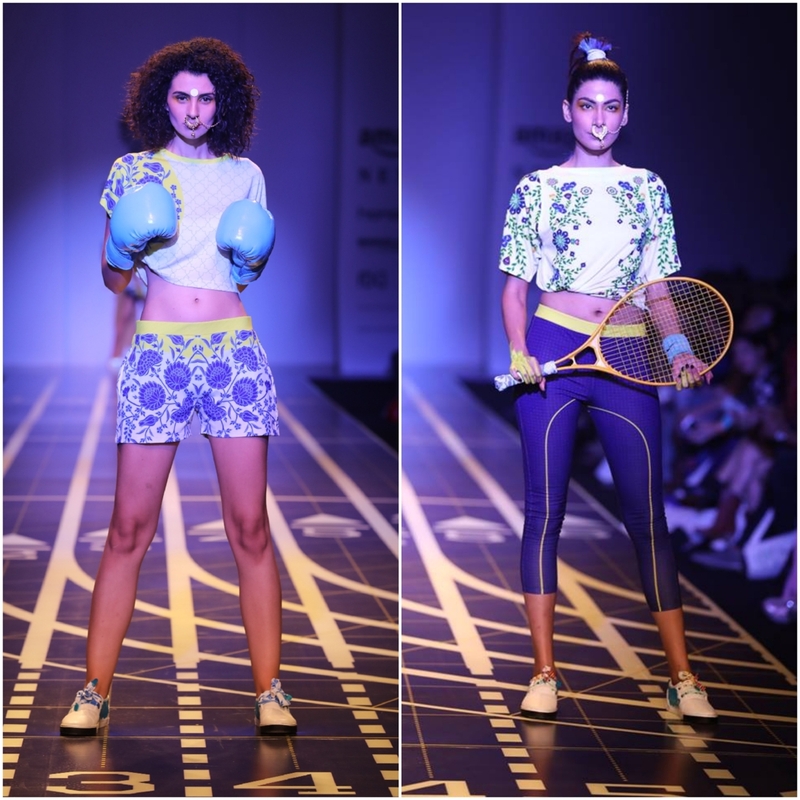 A true collection inspired by gorgeous Indian women representing the sporty, fit culture and the undying ageless fashion. Be it 98 or 101 fashion is indeed ageless. It wasn’t only models who were seen on the ramp during the show but there were some real life heroes as well who attracted eye balls. Mann Kaur, a 101-year-old runner who is known for holding the record for running 100 metres category did a little jog on the ramp. 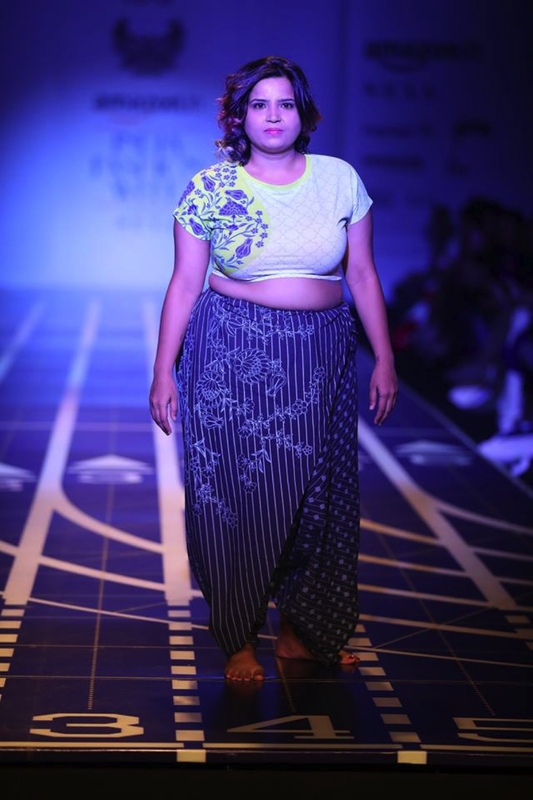 Also seen was Dolly Singh, a plus size Yoga teacher who walked the ramp gracefully sporting the collection. 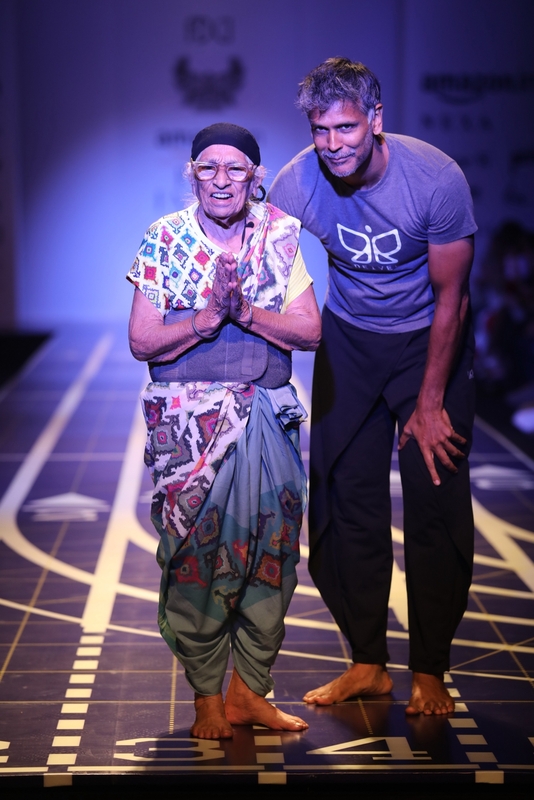 V Nanammal, a 98 year old yoga teacher, and Anshu Jensempa, a world record holder for climbing the Mt Everest twice within a week also made their fashion week ramp debut. Fashion, age, fitness surely go hand in hand! A big salute to all the heroes! It was a delight seeing the impressive styles enriched in rich colours, styles, patterns, the edginess, funkiness and with all the inspiration from the textiles, the designer has surely come out with something great for the modern and fitter India which is set to break all the rules and charm the world!